With Donald Trump within three points of Clinton in one recent poll (compared to an eleven point lead for Bernie Sanders over Trump), there are apparently some people who would vote for Trump. Both Trump and Clinton are going after Sanders supporters. As Sanders has said, his supporters will not automatically back Clinton if she wins the nomination, and many will not learn to like her. Clinton says she will go after Sanders supporters in a “very aggressive” manner. No matter how aggressively she goes after my support, nothing she can do can negate her utterly unacceptable record. Trump will have even greater difficulty in his attempts to obtain the support of Sanders supporters. He could attract the support of some Sanders supporters on issues such as trade. While his foreign policy speech was seriously flawed, he is still to the left of Clinton on foreign policy (as is pretty much everyone). Trump is significantly to the left of Clinton on the drug war. As Sanders has warned, Trump will use the email and Foundation scandals which he has stayed away from, which could also wind up putting Trump to the left of Clinton on government transparency, where she is already extremely conservative, as well as on matters such as government corruption and reducing the influence of money in politics. It is also refreshing to see a Republican candidate who does not advocate the destruction of Medicare and Social Security. Despite all of the negatives for Clinton, Trump has serious negatives of his own, including the manner in which he has pandered to racism, xenophobia, and mysogeny. Only thirteen percent of Sanders supporters have a favorable view of Trump, and currently only ten percent say they would vote for him. However, it could affect the election results if ten to thirteen percent of voters who otherwise might have voted Democratic should not vote Democratic due to opposition to Hillary Clinton. Many more who don’t like either Trump or Clinton are also likely to sit out the election or vote for a third party. Walker Bragman has raised the question of who is the greater evil at Salon and tried to make a liberal case for Trump. While I do not agree with all of his points, it is good that there are writers on the left who are not falling into the tribalistic support for Clinton and exaggeration of Trump’s faults (as big as they are) which has become common among many Democrats. Even if Trump is the greater evil, the real question is which candidate will do more harm in the White House. It is very likely that Trump will do less harm out of a combination of having less interest in going to war than Clinton and not being able to get sixty votes for his agenda in the Senate. On the other hand, many Democrats who would oppose conservative policies from Trump would defend comparable compromises from Clinton. Clinton has already indicated a willingness to compromise with Republicans on areas from Social Security to access to abortion. We have seen the damage from compromise with Republicans and triangulation by Bill Clinton. Similar compromises by Hillary Clinton with Republicans would be more likely to move the country to the right than policies from a Republican president who face opposition from Democrats. We would be more likely to see cuts in Social Security, and restrictions on access to abortion, if Clinton is elected compared to Trump or another Republicans. Plus we would be more likely to go to war under Clinton, more people will be incarcerated for drug crimes, and we will have a president more concerned with how she can profit monetarily from the presidency than working for the good of the country. Posted in Bernie Sanders, Bill Clinton, Donald Trump, Drug Policy, Environment, Foreign Policy & National Security, Hillary Clinton, Iraq, Scandals, Television. Tags: Bernie Sanders, Bill Clinton, Donald Trump, Drug War, Hillary Clinton, Iraq, Scandals, Stephen Colbert. RSS feed for comments on this post.. TrackBack URL. But who, in the real world, gives a flying fig what some 'luvvie' actress thinks about anything? "We would be more likely to see cuts in Social Security, and restrictions on access to abortion, if Clinton is elected compared to Trump or another Republicans." That, like so much of this column, is truly and even dangerously delusional. I hope we don't see a repeat in this election of those holier-than-the-rest-of-us Naderites who with great and noble conviction ended up giving us George Bush. Written like a typical Clinton supporter–deny the problem and resort to ad hominem attacks. This is hardly delusional to those who have paid attention to both Hillary Clinton’s views and to Bill Clinton’s record. See the link regarding this in the post. The Nader analogy falls apart here as Clinton plays the role of George Bush. The biggest problem with Bush getting elected was his neocon views. This year Clinton is the neocon, and is to the right of the GOP candidates on foreign policy. Other problems with Bush included conservative views on civil liberties, opposition to government transparency, and corruption. All also apply to Clinton. It makes no sense to warn about the evils of the Bush administration and simultaneously support Clinton. Ron, I'm sorry, but to suggest that Hillary Clinton is likely to restrict abortion, when women's rights have been the cornerstone of her entire political life, IS delusional. Alternatively, it represents an effort to totally demonize her on every possible ground – to extend legitimante criticisms to areas where they're entirely unwarrented, simply to paint her with the blackest possible brush. Thesis journalism with a vengeance. Proof positive of that one-sidedness is in your restrained criticisms of Trump – racist, xenophobic, misogynistic, torture-loving, Putin-admiring, America Firster Donald Trump, of all people. One really does have to be a deep Hillary hater to see her as a bigger threat to progressivism that Donald Trump and, if he wins, an inevitably right-wing Senate, House, and Supreme Court – the latter for a generation. Sheldon, once again you behave like far too many Clinton supporters in both relying on name calling and distortions of the argument. As I said before, you need to look at Clinton’s actual views and record. You also ignore the long history of liberal criticism of Clinton, including over her views on abortion, instead of writing it all off as coming from deep Hillary haters. Clinton has been criticized by many abortion advocates for her arguments based upon keeping abortion safe, legal, and rare. By stressing rare, she both stigmatizes women who have abortions and she plays into Republican hands. Knowing they cannot outright ban abortion, Republicans restrict access to abortion. They seek, like Clinton, to make it rare. Clinton has spoken of her willingness to compromise with Republicans on abortion, and she has received criticism from liberals from her past compromise in backing parental notification laws. She has said that she would consider restrictions on abortions as long as they take the health of the mother into consideration–which leaves a lot of room for further limiting abortion rights. It is far more likely that further compromise supported by Clinton will get through the Senate than anything advocated by Donald Trump. Of course Clinton’s weakness on abortion is low on a long list of liberal complaints about Clinton. In order to make your bogus “Hillary hater” argument, you cherry pick this and ignore all the other areas which I have concentrated on far more. Pretending that liberal criticism of Clinton comes from Hillary haters allows you to ignore the facts. You try to justify your attacks by distorting my views, suggesting that I dislike Trump any less. You claim, “Proof positive of that one-sidedness is in your restrained criticisms of Trump.” Calling Trump racist, xenophobic, and misogynistic, along other criticism, is hardly “restrained criticism.” It is hardly necessary to list all of Trump’s faults in a single blog post when readers are already well aware of them. As I pointed out, only thirteen percent of Sanders supporters have a positive view of him. Of course Clinton supporters prefer to claim that her opponents from the left are really supporting right wingers. Even your list of Trump’s faults glosses over Clinton’s faults. Clinton didn’t take a principled opposition to torture until she found that her views on torture didn’t go over very well in a Democratic primary race in 2008. Of course Clinton at her worst on torture was still better than Trump. I certainly don’t trust Trump on foreign policy either, but his position on Russia is preferable to Clinton’s position which risks getting us back into a Cold War (with her views on the Cold War being rather disturbing). You further distort my argument and move the goal posts rather far in justifying your argument by saying, “Scott Lemieux has the right takedown of this general view here.” Except that Lemieux is responding to a post which is making a substantially different argument than I am, and he does not take down my position. It is you who turn out to be delusional, to use your word, or at least rather ignorant of history, in predicting “inevitably right-wing Senate, House, and Supreme Court – the latter for a generation.” In case you haven’t noticed, not only Congress, but state legislatures have turned far more red while Obama has been in office. Part of this was the tendency of the Democrats to run Republican-lite candidates along the Clinton/DLC model. Part was also due to the historical trend that the party which controls the White House frequently loses seats. There is a very strong likelihood that Democrats will gain more seats in Congress in 2018 and 2020 if Trump is elected than if Clinton is president. With their advantages in states at play, the Democrats will hold well over 40 seats, allowing them to block anything outrageous from Trump. Trump’s agenda is also quite different from the traditional GOP agenda. If he does anything too outrageous Democrats would have Republicans joining them in blocking Trump. With Trump being to the left of the GOP on many issues, this might also allow for the possibility of a coalition of Democrats and non-Tea Party Republicans to break the current gridlock if Trump has any worthwhile proposals. The Supreme Court is by far the strongest argument favoring Clinton over Trump. While I fear she would follow in Bill’s footsteps and appoint rather moderate Democrats, especially as he did to the lower courts, they would still be far better than any picks from Trump. However, we also have to weigh this argument in her favor against all the arguments against her. How many deaths in wars started by Clinton, and how many people incarcerated on drug crimes, can be ignored over this? I suspect that Clinton is likely to be a one term president, leading to subsequent Republican control of the White House. Over the next generation, we very well could have more GOP-appointed Justices if Clinton tarnishes the Democratic brand to the extent I fear she will. "But who, in the real world, gives a flying fig what some 'luvvie' actress thinks about anything? " Note that in the my first post on Sarandon I questioned listening to celebrities as to who to vote for. However I did think that including her video might increase interest in the post (which risked being ignored as I didn't have time to post until Friday night). 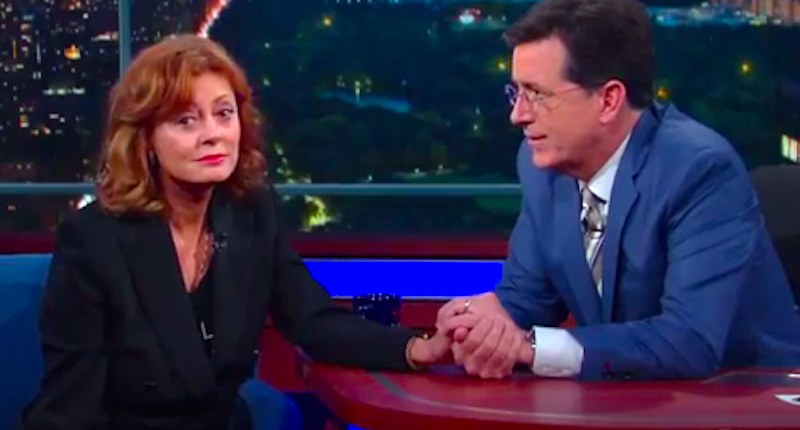 Plus I did like Sarandon's line about fearing Clinton's war record and hawkishness. It has been embarrassing to watch many of these progressive online news channels stoop to new depths to advance the narrative that Clinton is corrupt. Clinton is about as corrupt as Sanders—which is to say, not at all. What does it say about these commentators that they cannot praise Sanders without disparaging Clinton? Last year, the New York Times and Steve Benen noted that right-wing operatives were effectively trying to seduce progressives into launching attacks on Clinton. One can’t help wondering if this tactic has worked beyond the wildest dreams of these right-wing operatives: who would have thought, just one year ago, that online progressive news outlets would brand non-reactionaries Paul Krugman and George Clooney as villains? Typical distortions from Clinton apologists–falsely attribute criticism of Clinton based upon liberal principles to the right wing. It is well established how Clinton unethically made decisions regarding parties which were donating large sums to the Foundation and suddenly started paying unprecedented speaking fees to Bill. It is well established that she failed to abide by her agreement to disclose contributions to the Foundation when she was Secretary of State. Thus we have “right-wing” operatives like Common Cause calling for an audit of the Clinton Foundation because of this. It is also well established how she failed to follow the rules in effect as of 2009 regarding maintaining access to her email and complying with FOIA requirements. The criticism of Clinton by liberals has been going on for far longer than the ridiculous claims that right wing operatives were behind it a year ago. Her email has since revealed how she has been able to get her stories. While I’m sure you could find someone on line who has said virtually anything, Paul Krugman and George Clooney have not been branded villains by most on the left. These are just ridiculous claims to try to distract from the actual issues–a very common tactic of the Clinton attack. When you defend Clinton based upon nonsense such as this while ignoring all the facts, you are hardly going to convince any liberals to vote for Clinton. Her email has since revealed how Clinton has manipulated the press into posting favorable stories by trading access and even most Clinton apologists have dropped the bogus claims in that single NY Times article, which the Times has also ignored since that point. <blockquote><i>When you defend Clinton based upon nonsense such as this while ignoring all the facts,</i></blockquote>I'm not defending Clinton, I'm arguing with you — your biased and exaggerated attacks on her. Have you really failed to notice that my comments rarely if ever say anything about Clinton? Of course I have noticed you rarely say anything about Clinton, or anything else of substance. I’ve noticed you gave up trying to say anything about Clinton as the fact checkers have consistently and repeatedly backed up what I have said and debunked your claims. Instead you rely on on personal attacks as you have nothing left. You claim what I write is “biased”–as if it is wrong to be opposed to corruption by a government official and wrong to be opposed to conservative policies. You claim “exaggerated” because you know I’d blow you away with the facts if you tried to claim anything I said was untrue, and yet you also fail to provide any evidence that I have exaggerated–as I have not exaggerated anything.